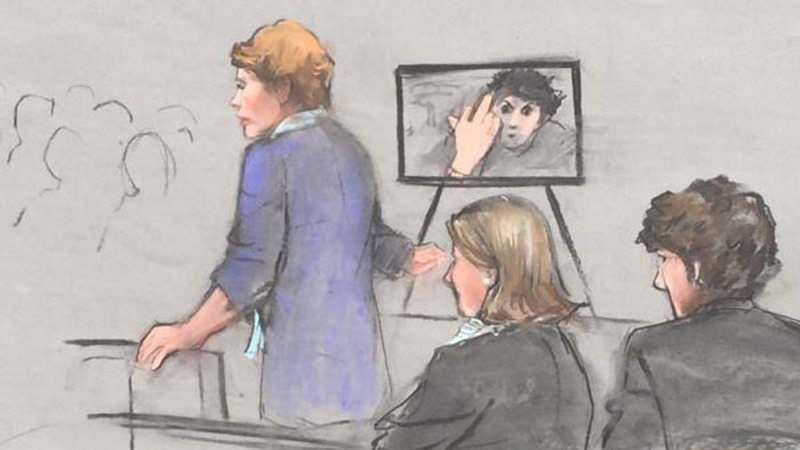 A photo of Dzhokhar Tsarnaev giving the middle finger to a courthouse camera was shown to a jury on Tuesday morning, as the sentencing portion of the convicted Boston Marathon bomber’s trial began. Tsarnaev, 19, is seen defiantly flipping off the camera in the jail of the federal courthouse, sometime during his arraignment in July 2013, and three months after he and his brother Tamerlan detonated two pressure cooker bombs near the finish line of the Boston Marathon, killing three and wounding hundreds. The photo was revealed during prosecutor Nicole Pellegrini’s opening statement, and shown on a courtroom television screen. “This is Dzhokhar Tsarnaev — unconcerned, unrepentant and unchanged,” Pellegrini said of the photo of the 19-year-old college student, taken as he sat in a holding cell where guards watched through surveillance cameras, according to the Boston Globe. “At one point, according to courthouse sources, Jahar lifted his hand toward the camera lens and flipped up his middle finger. Soon after, he walked into the packed courtroom and gazed into the rows of spectators,” the Globe reported. The photo drew an audible gasp from reporters gathered in the media room. Tsarnaev was convicted on April 8 of all 30 counts, 17 of which make him eligible for the death penalty. The 12-member jury must vote unanimously for him to receive the death penalty or else he will receive a life sentence. Victims of the attack have spoken out since Tsarnaev’s conviction over whether they believe he should be sentenced to death or instead receive life in prison for his crimes. The parents of Martin Richard, the youngest victim of the attack, penned an open letter that ran on the front page of The Boston Globe, asking that the death penalty be taken off the table. Several victims of the bombing also testified on Tuesday morning, providing harrowing accounts of the aftermath of the attack. The first witness was Celeste Corcoran, who made her way to the stand on two artificial limbs. She told the jury that the blast hurled her into the air and left her in such excruciating pain that she wanted to die. “I remember hearing just blood-curdling screams. I just remember looking around, just seeing blood everywhere, sort of like debris falling from the sky,” Corcoran said. The prosecution also played video showing the chaotic aftermath of the attack. Victims could be heard screaming in pain and smoke was seen rising from the sidewalk where one of the bombs detonated.